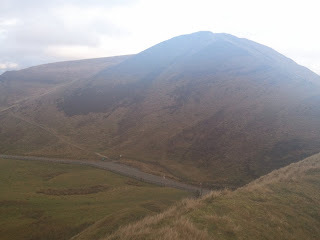 Blindly following the sat nav, we came over a hill into what we'd soon realise was the Edale Valley. Kinder Scout was majestically silhouetted against the night sky like a sleeping giant and we could see the lights of Edale twinkling far below. This was our first adventure in the Dark Peak and now we knew that we'd arrived. It's strange how each trip we think can't possibly top a previous one, and yet somehow something takes your breath away and you realise that yet again you were wrong. That's how you know you've got the bug. After a month and a half of waiting, we were like small children, wide eyed and bouncing in our seats with excitement. 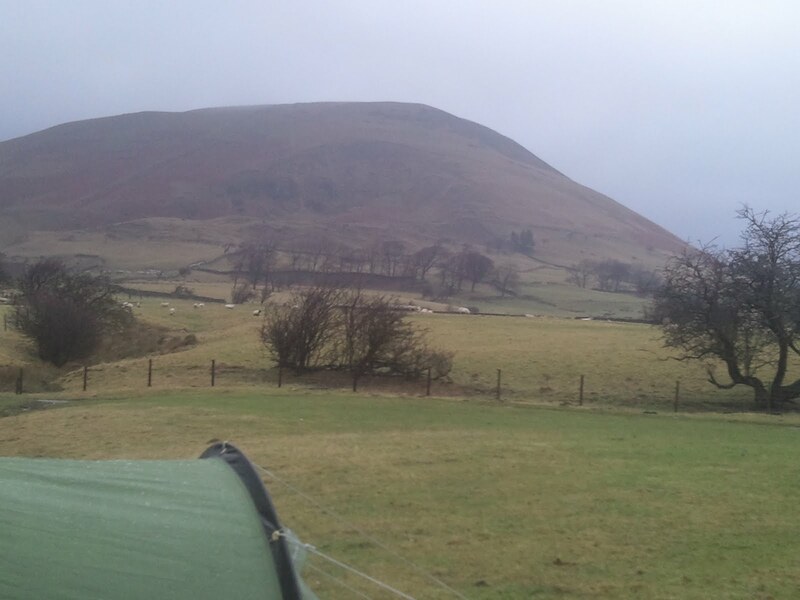 The plan was to shake off our relaxed pre-Christmas camping habits involving lots of gear, multiple cookers and over reliance on having the car nearby and get down to some back to basics camping in preparation for our next trip. We'd also do a bit of a recce of the area as our next hike is a long weekend up Kinder Scout and head out for a walk with our packs on (minus tent) to get back into practice. So, for basics camping we'd found Whitmore Lea Farm, where you camp in a bumpy field full of sheep and have access to just a toilet and a tap for water. That said, with it's location beside the river, you could probably do away with the tap and fetch water straight from the river. We bumped down the track in the pitch black, almost taking the bottom off the car, and pitched our tent (very well I might say) on a flat patch of grass as much out of the wind as possible. We had neighbours for the first night, but the second was spent blissfully on our own, listening to the sound of the water rushing past, the blustery weather and the regular trains like monsters in the night. Next day, after Phil's unexpected conversion to porridge (yes, I know bacon sarnies are better!) we left Barber Booth following a footpath across the fields. Thank goodness for the high ankle cuff on my boots as I narrowly escaped filling my right boot with mud following a foolishly thought out step. We took the steadily rising Chapel Gate track up onto the top of Rushup Edge. I was amazed at how many users the track had, as we met a steady stream of walkers, runners, mountain bikers and motorbikes. Apparently they're looking to close the track to light vehicles. I can't pretend to know whether the bikes are seriously eroding the track but you've gotta feel for those guys who've been enjoying riding the trail for over 30 years and now might not be able to any longer. Maybe on a sunny day I'd have felt different but I actually enjoyed meeting all the people and had respect for them out enjoying the Peaks on such a grey, wet day. On the top, my hat had to be relegated to my pocket for fear of it blowing away and the wind whipped round my ears, chilling my head until it ached but giving me an absolute sense of freedom and release that I've truly missed. I couldn't help the massive grin on my face as I looked around at the differing landscape and colours. The undulating ground of Whitemore Clough, the rolling dales and green pastures of the White Peak and the stark cliffs created by quarrying at Eldon Hill. Kinder Scout looked dark and foreboding in the mist, a place that takes no prisoners. We walked to Lord's Seat but never stood on top due to the near gale that made it difficult even to walk in a straight line. Instead we tried to shelter in the hollow beside it, drinking a warming cup of soup as the freezing cold rain hit our faces like needles. It sounds like the most awful weather and it was, but in a way it added something to the walk, though I would like to see the views again on a clear spring or summer day. We carried on along the ridge, which thankfully isn't a narrow one and the wind was much lighter here and then down to the lane at Mam Nick. We'd considered carrying on and including Mam Tor in our route but weren't sure that we could get it in before it began to get dark so decided to leave that for another trip which is a great excuse to come back if ever we needed one. Somehow it seems to be getting harder and harder to return to reality and the 9-5!